Python is one of the most popular programming languages. Whether you want to write your own code for Artificial Intelligence, Machine Learning, Internet Of Things, Bigdata and Data analytics or Automation, Python is one of the best choices. Myself Python developer. Till coming this day, I have learned many programming languages and worked on. If you ask me, my foremost preferred language is Python. You are here and reading this post. You may be well educated to understand the importance of Python. Or there may be someone who has referred you this tutorial and asked to learn the Python. Whether you are a student or a professional working out there, I must say, your choice is Right. If you are in the IT sector, Python can make your future secure and enrich. What’s there stopping you today learning Python? I welcome each one of you to our Python tutorial. It’s my pleasure to help you to take your Python skill to the Next Level. I would love to help you to become the Proficient Python Programmer. How to Make the Best Use of this Tutorial? Who Can Use This Tutorial? Python is general purpose programming languages, just like C/C++ and Java. It is known for being the most versatile programming language as it can be used in many different technology trends. Python is useful for Data Science technologies like Machine learning, Artificial Intelligence… Many of the automation scripts are written in Python. On another side, there are many Python web frameworks to build websites from small to complete enterprise level websites. Python is one of the easiest programming languages to learn (at least for beginners to start with). It also one of the highest paying programming languages. What do Google and people say about Python worldwide? This graph shows how Python is trending. There is a huge increment in Google Search about Python worldwide from 2004 to the present date. For Career Point of View: Learning Python can open many Job opportunities. Python is one of the best choices. It is also used as a scripting language and very much useful for automation. Most of the testing automation is carried out in Python. Recently Instagram moved from Python 2 to Python 3. These are some quick examples to envision the power of Python. And you already aware, all the above-mentioned technologies are trending technologies in the IT industry. Python is one of the best choices that can open so many doors. For Learning Point of View: Despite having so many use-cases and scalability in a wide variety of technologies, Learning Python is not much difficult if you follow proper strategy with dedication. In fact, it’s fun if you enjoy it. There are so many libraries that have already written. You can just import those libraries into your program and call the function defined in those libraries. Like many other companies, Google has developed open source project called tensorflow for Machine Learning. Does any other programing language provide this feature better than Python? There are so many points I would like to mention here. But, let’s keep it short for this tutorial. Moreover, it feels great when you feel it by yourself while Learning Python. How to Make the Best Use of this Python Tutorial? Are you serious about Python? I have shared a complete Python guide which includes various tutorials. You can find a link to all tutorials in right sidebar widget. 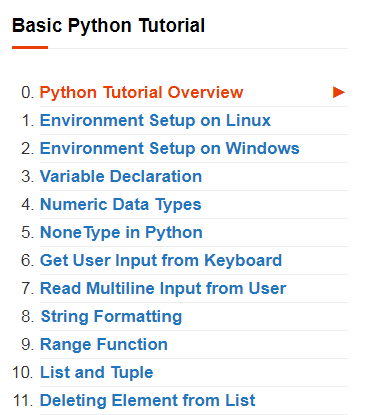 If you want to learn Python completely, follow the Python tutorial in the same order as I mentioned. Go through each article. Read it completely, understand the code. Copy and run the same code on your system. The visualizing output of the program makes you more enthusiastic and confident. If you stuck anywhere or if you have any problem understanding code, use the comment section below to each article and write your query. I reply to all the comments. Keep building small projects as you go with this tutorial. Try to automate the small routine tasks. Myself Aniruddha Chaudhari, author of this complete Python online course. 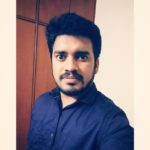 I completed my master of Computer Science from NIT Trichy. I enjoying my journey being a Python developer and write Python code almost every day. For me, this course is to share my Python knowledge and experience with you, in the intention of helping and educating programmers to learn Python. For any doubt about Python, you can always say ‘hi’ to me. For any specific query related to any tutorial, feel free to comment. I will reply as soon as possible and will try my best to help you. Hoping for your constructive and embracing feedback ;), so that I can keep this tutorial more updated for you. All the Python code and contents posted in this tutorial are free to use. I personally spend a lot of time, writing code, doing research, exploring multiple libraries and then curating content for you. So, just do a favor; if you are using any of the articles from this tutorial, please give a link-back to the article. My mission is to spread the knowledge and guiding more geeks by tutoring Python skills. Being part of this mission, you can also refer this tutorial to your friends, relatives or whoever you feel benefitted. All the articles we have written in this Python Programming Tutorial are best of our knowledge. A human makes mistakes so we may. If you find anything is not working for you, feel free to write back to us. Are all Elements in List Same? Can I build Mobile App in Python?